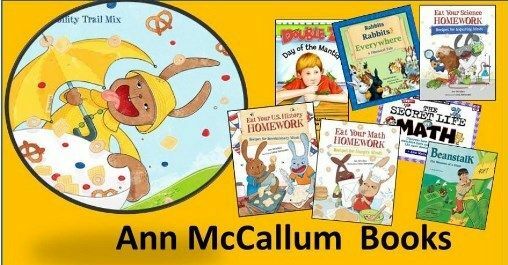 Ann McCallum Books include the Eat Your Homework series in History, Math and Eat Your Science Homework. As homeschoolers we love to eat and all of our school is 'home' work! The perfect combination. 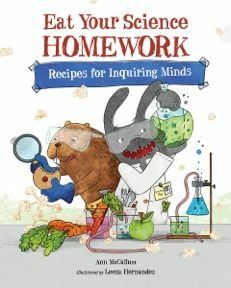 Eat your Science Homework has recipes for inquiring minds. Cooking is an excellent look at chemistry and chemical interactions. This book gives the kids a glimpse at science while they are learning to create in the kitchen. They don't even realize they are doing 'school'. The book has 6 recipes for science experiments. Each experiment starts with some facts on the project, with key words bold faced and defined. The first one for example was on Atoms and we made Atomic Popcorn Balls. We learned about words like; atom, subatomic, elements, periodic table, and molecules. After we learn a bit about what we are working with, we have the recipe which includes all you need for ingredients, your prep time, and cooking time. This is helpful for prepping what you need to buy ahead of time and knowing how long your experiment will take. The atomic popcorn balls only took 20 minutes total. After the recipe is a page on science facts called the Science Sampler. This particular recipe has some common elements for you to find around the house, the periodic table, and information on states of matter. This book is a great go along book for studying specific areas of science. You can coordinate the homework assignment that goes along with density when you study it. The other option is to just work your way straight through the book. Use it as a fun time of science, learning a variety of areas. In addition to learning about atoms. Eating Your Science Homework teaches the student about Density in their recipe Density Dressing and Veggie Sticks. I bet you can guess what this one will involve. Oil and Vinegar and how they just don't mix. This gives an excellent example of density, and tastes great! The Science Sampler has you try to mix a few other products to see how they fair as well. You can make invisible ink and learn about the pH scale and acids and bases. Individual Snack Pockets are your food for this experiment. Hidden in the pocket is a big surprise. We learned about fingerprints and the different design categories for how the lines are on the finger. This led to making cookies where no two were identical, just like fingerprints. Sediments and different type of rocks was one of the lessons. I enjoyed how it included the Mohs scale of hardness and mentioned that to the kids when we were learning about rocks. Look at the vast group of sciences this book covers! A glimpse into forensics, geology, chemistry, and even astronomy. I like how it exposes the kids to a variety. I think this is useful for the younger aged kids from 7-10. Of course the entire family will get in on the eating part! I must add that the illustrations in the book are fun and quirky. They are cartoons, but unique and full of character. Leeza Hernandez did an excellent job at targeting her young audience, yet making the characters really showcase science. See what my crew mates thought of this and other Ann McCallum products by clicking on the banner below.